Bhaji is basically Indian tempura – vegetables battered in a spicy flour coating, deep fried and served piping hot straight out of the oil, slightly crunchy on the outside and soft on the inside. In our house, bhaji was the late afternoon snack of particularly lazy Saturday afternoons following a nap. Bhaji was the pre-dinner treat that my mom would have waiting when I came home for weekend visits from college. Rainy day comforts. Winter blues chasers. Family get together indulgences. Bhaji still reminds me of those times at home and manages to conjure warm feelings of comfort and goodness. It seems silly to think that such a simple food could have such effect, no? *Cornmeal is optional. My mom had the idea to add this to the batter after we had really good bhaji somewhere…maybe Chennai Garden in NY. I tried it and it turned out nicely because it gives a nice, thick and crunchy coating. But it’s not required. 1. In a large mixing bowl, mix together all of the flours. Mix in the lal mirch and salt. 2. Add water – add 1 cup of water first and mix. Add more water as needed until the batter has a pancake like consistency. The batter should not be very thin. If it is too thin, add more flour. 3. Taste the batter to make sure there is enough lal mirch and salt. 1. Peel the potato and cut them into 1/4 inch thick slices. 2. Cut the onion down the middle and cut into thin slices. 3. Cut the cauliflower into small florets. 1. 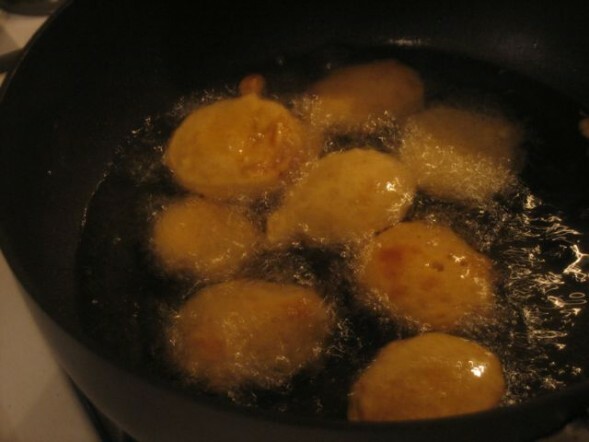 Heat enough oil (I used canola) in a deep skillet to deep fry the bhajis on medium-low to medium-high heat. 2. When the oil is hot, drop a handful of the veggies into the batter. 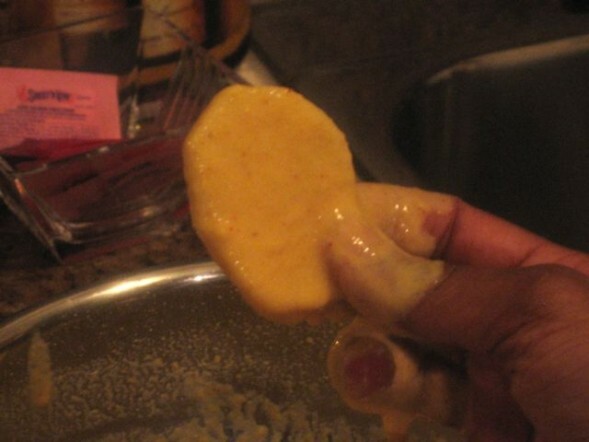 Take one veggie, make sure it is well coated and then remove it from the batter holding holding the veggie piece upright so the excess batter drips off towards your hand. My mom taught me this trick. It keeps the bhaji from developing “tails” or long pieces of batter dripping off the side (like a tail). Although she confessed to me that she really like the tails b/c they get nice and extra crunchy. I’m inclined to agree that I like tails. 3. Gently roll/drop the bhaji into the oil and fry until golden. You may need to turn the bhaji over if the oil is not deep enough. 4. 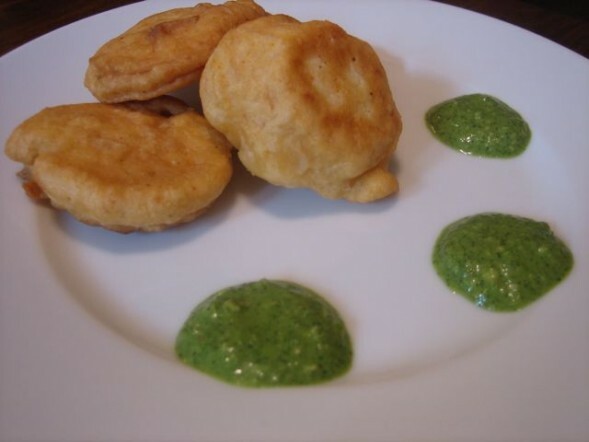 Enjoy while hot with ketchup and mint or coriander chutney. There are a lot of different variations for bhaji. My favorite veggies for bhaji are cauliflower, eggplant, potato and onions, and Rajat really likes paneer bhaji. We made a fresh bowl of mint chutney for our bhaji and the fresh zing of mint really hit spot. Maybe someone out there can settle a little point of disagreement between me and Rajat – are bhaji and pakoras the same thing or different? I say different. Bhajis are battered vegetables and pakoras are deep fried, crispy dough bundles. He says they are the same thing. Battering the bhaji – no tails! Update: Also, on the topic of bhajis, one of my favorite food blog sites, Serious Eats just recently had this post about the UK ‘s Walkers’ onion bhaji potato chips. I would love to get my hands on a bag of those (or Lay’s Masala or Pudina flavored chips…which I think are only available in India) to eat with some rasam and rice. Mmmm. Foodie, glad to see that there is a legitimate controversy out there over this in the world at large and not just in our house 🙂 I seem to remember what we ate at home that was called “pakoras” didn’t have veggies in them like bhajis do. We call these pakoras and i guess different ppl call them differently, but be it bhajis or pakoras they are deep fried and taste heavenly. I like the idea of adding cornmeal to it….I think I’d like to try it. ‘bhajiyas’, as they are called in Gujarati, are welcome any time….my husband requests them everytime it rains or there’s a snowstorm. Looks good, Nithya….and btw, its good to finally match a face to a name! Trupti, I asked Rajat what he associated with eating bhaji, and he said “family get togethers”, “rainy weather” and “winter time.” He also added that bhajis are a food that you never eat alone – they are always eaten in the company of lots of family and friends. Sort of funny since he and I never actually talked about it after I had already written post! Seems to be a common theme afterall 🙂 Btw I got over my fear of the internets and yes, decided to add a picture to the about page! That vegetable tempura looks good! So glad I found your blog via Twitter. Those bahaji look amazing. I’ll try them next weekend. The mint chutney sounds amazing too. @ Mike – thanks for the compliment! @Usha – that seems to be the popular distinction…maybe this weekend will be a pakora weekend. Let me know how the cornmeal turns out. Bhajji is definitely great for rainy/snowy weather although I love it pretty much anytime. Loved the idea of adding cornmeal to the batter, will give it a try the next time . I think the difference between bhajji and pakoras is in the batter and the crispiness of the final product, pakoras I believe are more crunchy and crispy then bhajji ! just want to clear my doubt…corn meal and corn powder are the same or different? I would love to comment using my real name but sometimes you just can’t do what you like do to. I hope that explains me being commenting anonymously. 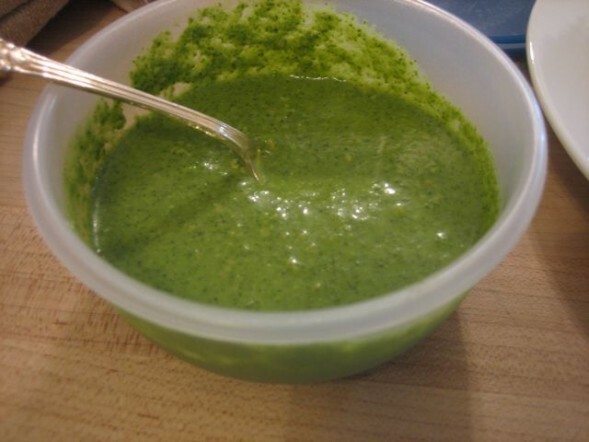 I searched the site and was unable to find the Mint Chutney…..I must have your recipe!>>> It looks so good. I don’t have a recipe for it on my site, but I do recall that I followed a recipe very similar to this one http://www.guardian.co.uk/lifeandstyle/2003/sep/21/foodanddrink.shopping. I substituted peanuts for the walnuts. Most mint chutneys don’t have nuts in them. The nuts are why mine has texture.